We’ve been reading Gingerbread Friends by Jan Brett over and over this month. 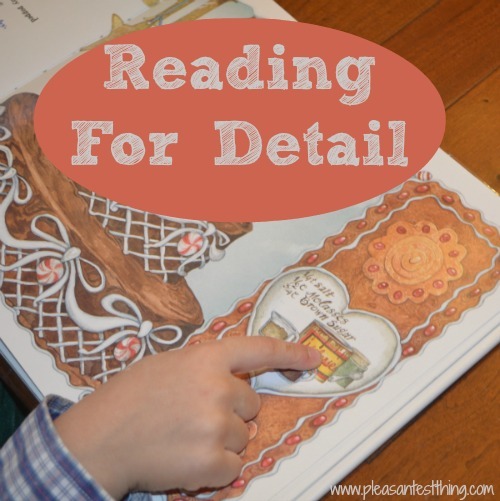 As we’ve been reading, we developed a great activity to promote reading for detail in toddlers – and this book in particular works well with our activity. Gingerbread Friends has Brett’s trademark illustrations, with borders that are so much more than frames for her pictures. In this book, a recipe is contained in the the border. The first few times we read it, my preschooler did not realize that there was a recipe in the border. As I read the pages, and paused to look at the illustrations together, he turned the pages, impatient to get to the action (he loved the chase scene!). We went through the book without reading the words on the pages, just looking at the pictures. I wanted to show him that the pictures give information beyond what the words provide. We started with the center picture, and discussed the action taking place in each scene. We looked at the facial expressions (happy Gingerbread Baby, hungry cat, angry bakers). We talked about the way the pictures showed movement (candies being juggled, animals trying to pounce on Gingerbread Baby, Mattie skiing). I asked him what time of year it looked like it was, what the weather was like, if it looked like Gingerbread Baby lived in a city, town, or country. Then we looked at the borders. I love Jan Brett’s borders. She frequently includes action happening contemporaneously with that in the main picture, but focusing on a different character than the one pictured in the large picture. 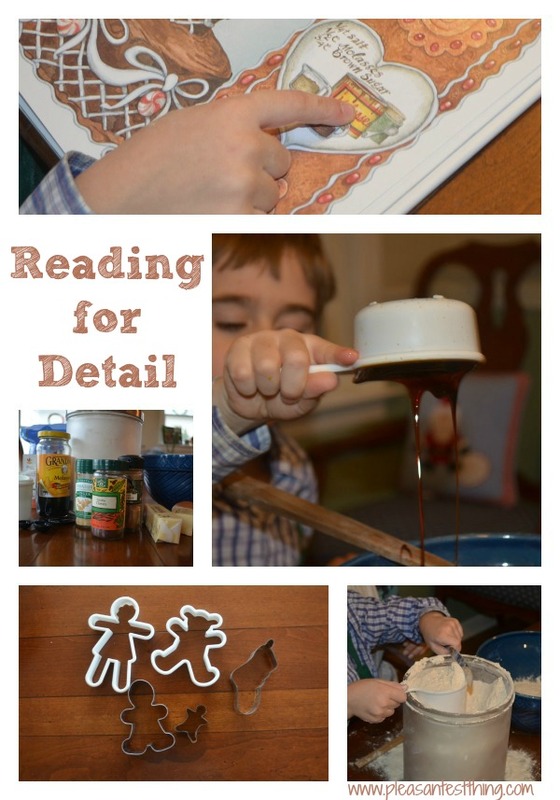 In this book the recipe Mattie uses to make his Gingerbread Friends is included, step by step, in the border. I asked my son to look at the border, and tell me what he saw. He happily realized there was a recipe. I gathered the ingredients, and we went through, step-by-step, and made the recipe from the book! To make the recipe, he looked at each page, pointed to the recipe, and then found the ingredients. So when the recipe called for 2 teaspoons of ginger, he would look at the spices, find ginger, and then find the teaspoon measures. I let him measure, mix, and roll out the cookies, with minimal help from me (mostly disaster avoidance, like grabbing the salt before he poured it into the bowl). Having a 4 year old measure and stir (vigorously) is not the best test of a recipe. Ours didn’t turn out, but that by no means indicates that the recipe is a bust. Our version was very crumbly. If anyone else tries it, I would be curious to know how it turned out. Crumbly or not, it was a fun way to really explore the importance of illustration. This post was written as part of the Virtual Book Club for Kids! Check out all the other wonderful posts inspired by Jan Brett below.